If you have had the pleasure of laughing hysterically at any YouTube videos of the Nuggets center (see above), you know just how utterly clueless he can be at times. Free throw line dunks in game are only the beginning to his on-court antics and sometimes he just looks so hopelessly lost. 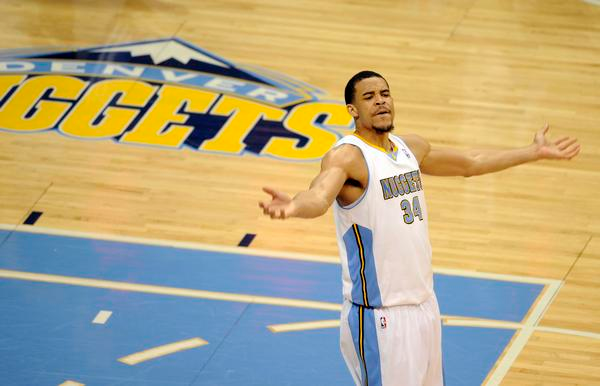 So, unless somebody else comes into the league with the lack of intelligence that McGee brings to the table, this award is created and won exclusively by the guy who is never quite sure what is going on, JaVale McGee. This award is handed out to the player that every opposing team loves. The traditional Defensive Player of the Year award goes to a player that shuts down opposing offenses. Well, that can be useful occasionally but this award is more important. Now we’re talking about a player who is so great that he can shut down his own team’s offense. It takes a truly special player to do that. And for now at least, the winner of this award takes first place in a landslide. Russell Westbrick Westbrook is truly one of a kind because he has the ability to hold three-time scoring champion Kevin Durant under 30 points per game on any given night. With the ever-decreasing concentration of (good) white players in the NBA, the White Man Wonder award goes out to this year’s best player who looks like the color of the basketball net. Kevin Love may be the perennial favorite to take home this trophy but his injuries this year prevented him from taking home this award’s first annual winner. Undoubtedly, half of the Vanilla Towers in Golden State earned it this year. David Lee, the 20-10 machine, takes home these honors. Who holds the single season record for technical fouls? Answer: Rasheed Wallace. Do you know who holds the second, third, and fourth highest single season records for T’s? Yup, those titles also go to Rasheed Wallace. If there’s one thing that you can count on Rasheed Wallace for, it’s yelling at the refs. Even though the list of top 20 players with T’s in 2013 is a star-studded lineup, no better and more frequent complainer exists than the Lakers great, Kobe Bryant. A 95-year veteran of the NBA, sometimes it’s hard to see if Kobe’s complaining or asking for a cane but he always finds a way to put on that “come on, ref” look when he gets fouled. The reality according to Kobe: if I missed a shot, I was fouled. Simple as that. Kobe, here you are, another trophy to add to your walls of awards and accolades. I lost count of how many retirements the great Michael Jordan had accumulated over the course of his careers. Was he trying to retire one time for every ring he won? This award honors his greatness in deciding to retire and unretire and recognizes the player who just can’t seem to finally pull the plug on his NBA playing career. Grant Hill, at 40 years old, averaged 3 points and 2 rebounds per game in 2013 which is almost on par with the great Luke Walton. Grant, it's time to call it a career. If you can explain the logic behind the Dennis Rodman outfits…who are we kidding? Nobody can do that. 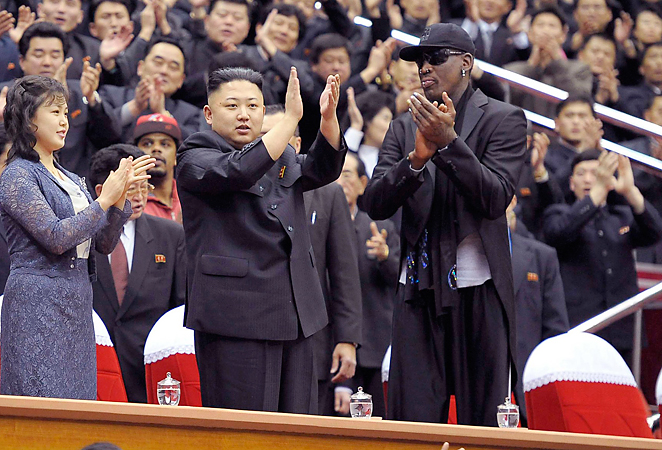 If anybody can surpass Rodman’s attire, I would be simply befuddled. The array of colorful and unusual clothes that Rodman adorned was interesting to say the least. Paying homage that trend-setting style, this award landed unanimously in the possession of the always attention-grabbing Russell Westbrook. My philosophy: Westbrook is auditioning to become a United States ambassador to North Korea. Despite leading the league in three-point attempts for three consecutive years in his highly regarded career, Antoine Walker spent years chucking from beyond the arc for the Boston Celtics. Finishing off his career with a .325 3PT field goal percentage, Walker shot below 30 percent for three different seasons. Apparently it is true: ignorance is bliss. There is no more perfect player to win the chucking award than Bucks guard, Monta Ellis. An excellent thrasher, Monta hoisted 4.0 threes a game in 2013 and shot…wait for the ball to hit the iron…28.7 percent from beyond the arc. Somebody enter this man into the three-point shooting contest. There’s something to be said for the big man who, well…isn’t really that big. Ben Wallace was known for being a defensive force at center despite being only 6’9”. Leading the Detroit Pistons to the 2004 championship, Wallace also topped the league in rebounding and blocks throughout his career. So before the Little Man Complex kicks in, let’s give some love to the not-so-bigs who use energy and an undying motor to propel themselves to NBA success. And for the 2013 Little Big Man Award, the 6’8” Kenneth Faried comes out on top. The Manimal has a motor that never quits and is an athletic monster who will likely compete for these honors for years to come. Aside from wanting to vomit every time I hear the name Metta World Peace, I laugh at the idea that the man could bestow such a name upon himself. From the Malice at the Palace to innumerable other incidents, Not World Peace has made a name for himself by advocating for just about everything except world peace. Thus, you have the above named a-War-d. To nobody’s surprise (save maybe his own), DeMarcus Cousins is the perfect recipient for these honors considering his behavior was so bad that in December his own team suspended him. Congrats, DeMarcus. 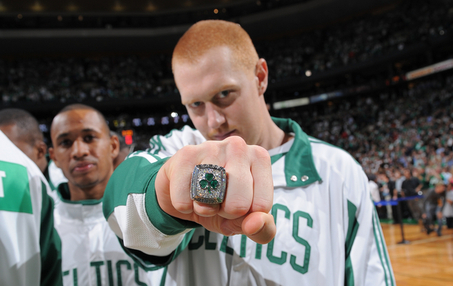 Even the NBA champion LeBron James stands little chance in the debate of greatest NBA players of all time when you mention the indomitable Brian Scalabrine. The two man debate for GOAT is between the White Mamba and the 4.6/2.3/1.0 career average of Brian Cardinal. So, in honor of these two greats, the real MVP award is named after the great Brians of the NBA. The Brians would support the man who earned the 2013 MVP honors, none other than Timofey Mozgov. Not only did the Russian Rocket pile up 2.6 points and 2.6 rebounds in 2013, but he also kindly volunteered to be posterized by DeMar DeRozan in one of the greatest dunks of 2013. The Portland Trailblazers always seem to be the recipient of either some terrible luck or just poor decisions. Sam Bowie is famous for who he is not. That person he is not is the player drafted one slot below him in the 1984 NBA Draft: Michael Jordan. As if that was not bad enough, Portland proceeded to pass up on one Kevin Durant in the 2007 NBA Draft for the durable Greg Oden. Aside from the other achievement differentials, in 2010, Durant played in as many regular season games as Oden played in his entire career (82). So surely Portland would figure out a good draft pick in 2011, right? They opted to stop the trend of drafting big men in favor of a guard. Instead of Kenneth Faried, they selected the 6’2” Duke guard, Nolan Smith. Smith averages 3.3 points and 1.2 assists for his career. However, the irony is that the recipient of this terrible decision is another team that dwells in the cellar of the NBA and the last men laughing are the Blazers front office! In the 2012 draft, Portland selected Damian Lillard with the sixth overall pick. One slot earlier, the Kings opted for Thomas Robinson and his 4.8 points and 4.5 rebounds per game. Although he was hardly as bad of a choice as Bowie, Robinson was so great that the Kings decided to share his talents and traded him mid-season to the Rockets.